Wendy's Sausage & Egg Burrito is part of a breakfast test at one of my local Wendy's restaurants and is very simple with only cut-up sausage, scramble egg, and American cheese wrapped up in a small flour tortilla for 99 cents. Wendy's Classic Breakfast Sandwich is offered at one of my local Wendy's restaurants as part of a breakfast test and features bacon, cheese, scrambled eggs, sausage, and some sort of tomato mayo sauce on a kaiser bun. I picked one up for $2.79. I tried Wendy's Cinnamon Swirl at a local Wendy's where they serve breakfast as part of the chain's testing. It's basically a cinnamon roll with icing and similar to McDonald's Cinnamon Melts and is priced the same at $1.69. Back in '08, I wrote about trying Wendy's breakfast test and some of the items they were offering at the time. Now it's 2011 and, somehow, they're still working out the kinks. One of my local Wendy's restaurants is still serving breakfast, but it looks a little bit different from their most recent and fancier looking test at http://www.wendysbreakfast.com. It looks my local joint is serving up items from an older test perhaps maybe because they still have the equipment for it. Designed by Totino's to be a less messy, kid-friendly, on-the-go snack, new Pizza Stuffers gives you Totino's flavor but in sealed in a pocket crust and comes in three familiar flavors: Cheese, Pepperoni, and Combination (sausage & pepperoni). "Less mess" seems to be a major selling point with this one. 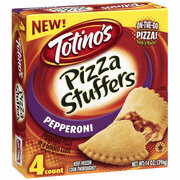 Unlike their pizza rolls whose contents tend to spill forth while cooking, Pizza Stuffers are specifically designed to keep their filling inside. They can be microwaved (~2 minutes) or cooked in the oven for a crisper crust (~10 minutes) and come frozen four to a box retailing for $3.99 per 14-ounce box. New Chips Ahoy! Chewy Gooey Megafudge cookies feature brownie-like chocolate chip cookies with white chocolate chips and a layer of semi-liquid fudge in the center. A 10-ounce package goes for around $3.29 or about $2.00 on sale. To mark the release of Madden NFL 12, Frito Lay has brought back their limited-time Stadium Nacho Doritos tortilla chips (they also brought back Tailgater BBQ). An 11-ounce bag retails for $3.99 but I picked up this one on sale for $1.99. Ben & Jerry's Chocolate Macadamia features chocolate and vanilla ice creams swirled together with fudge covered macadamia nuts mixed in. A pint typically retails for $4.99 but I tend to pick them up on sale at around the $2.50 mark. A slight revamp on Arby's prior Crispy Chicken Fillet Sandwich, the new Cravin' Chicken Sandwich features a slightly different take on the fast food standard premium chicken sandwich with Cravin' sauce plus the standard lettuce, tomato, and breaded chicken fillet on a sesame bun. Roasted chicken is also available but I went with the breaded chicken filet. Both versions cost $3.79. McDonald's Dollar Menu McDouble is basically their Cheeseburger with an extra patty or their Double Cheeseburger with one less slice of cheese, however, you want to look at it. If you're unfamiliar with that, a McDouble features a slice of American cheese between two beef patties, topped with pickles, onions, ketchup and mustard on a toasted bun for $1. A "kitchen sink" breakfast burrito, Carl's Jr.'s Big Country Breakfast Burrito features sausage gravy, scrambled eggs, sausage, ham, bacon bits, hash brown nuggets, and shredded jack and cheddar cheeses wrapped up in a warm flour tortilla. It comes at $3.29 a pop at my local Carl's Jr. The P'Zone is Pizza Hut's name for their calzones which are available in: Pepperoni, Meaty, and Supremo. I recently picked up a Supremo P'Zone (i.e. "supreme") which comes with Italian sausage, green bell peppers, red onions, and mozzarella cheese folded up in pizza dough and baked. For a limited-time, Pizza Hut is offering them for an even 5 bucks. Jersey Mike's Famous Roast Beef and Provolone cold sub promises "Certified Angus USDA Choice" roast beef cooked on the premises paired with provolone and then built the way you like it. I picked up mine "Mike's Way" which comes with onions, lettuce, tomatoes, red wine vinegar, olive oil and spices. A sizable "regular" comes in at $7.75. Wheat Thins Fiber Selects Garden Vegetable Crackers feature 5 grams of dietary fiber per serving and a dried vegetable blend of carrots, onions, cabbage, tomato and, green and red bell peppers mixed in. It's normally $3.59 for a 7.5-ounce box (compared to a 10-ounce box of regular Wheat Thins) or around $2.00 to $2.50 on sale. Edwards Hot Turtle Brownie with Creamy Ice Cream is a frozen option for brownies a la mode that comes two individual servings to a box. Each serving features a fudge brownie with chocolate chips, praline pecan, caramel, and vanilla ice cream. They're normally around $3.59 but can be found on sale for around $2.00. The standard fries at Arby's are seasoned Curly Fries. They used to have regular "homestyle" fries (skin-on) but I guess they weren't that popular. The Curly Fries are available at $1.79 for a small, $2.19 for a medium, and $2.39 for a large. In addition to the new, limited-time Oven Crisp Chicken Sub, Subway also has a new, permanent menu addition, Yogurt Parfait. It's made fresh daily with low fat vanilla yogurt with a layer of strawberries and blueberries and a granola topping. A small cup is $1.49. Subway's new Oven Crisp Chicken Sub promises crisp, breaded chicken without the frying and oil and is part of their Fresh Fit menu with less than 7 grams of fat per serving. I picked up a footlong (that's two servings) for $6 at my local Subway. A six-inch was priced at $4. 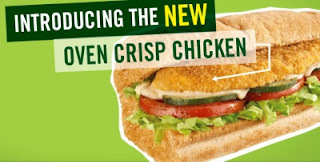 For those of you itching for the crunch of fried chicken without the actual frying, Subway has their new, limited-time Oven Crisp Chicken Sub which features chicken that is breaded and baked to give you crisp chicken without the grease. A six-inch Oven Crisp Chicken Sub fits into Subway's Fresh Fit Subs clocking in at 420 calories and 6.7 grams of fat in its default build (which includes honey mustard and no cheese). Suggested price for a 6-inch is $4.00 and for a foot-long is $6.00. The sub will be available nationally until September 30, 2011 although I'm sure some Subway locations will try and keep it on the menu after that. This is actually something Subway has been testing for a bit. Jack in the Box's Jumbo Breakfast Platter has your basic egg, meat, potatoes, and pancakes covered on one plate/container. Specifically, it comes with scrambled eggs, your choice of bacon or sausage, hash brown sticks, and mini pancakes. I picked up a platter at my local Jack's for $2.99. 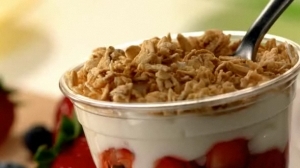 Subway's new Yogurt Parfait is touted as "Made fresh daily with sweet blueberries, juicy strawberries, crunchy granola and creamy yogurt" which basically sounds to me like the McDonald's Fruit 'N Yogurt Parfait. The yogurt used is a lowfat vanilla yogurt. With limited availability and participation, some Arby’s restaurants now have the new Smokin’ Chipotle Chicken Sandwich. 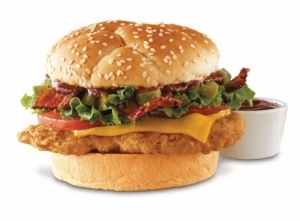 The sandwich features a crispy chicken fillet topped with Arby's new Chipotle BBQ Sauce, as well as pepper bacon, cheddar cheese, diced jalapenos, lettuce and sliced tomato on a toasted bun. It is also available with roasted chicken if you're looking for something less fried. Corner Bakery Cafe's Spinach Sweet Crisp Salad is new for this summer and features baby spinach tossed with freshly-sliced strawberries, oranges, red grapes, dried cranberries, green onions, creamy goat cheese and raisin pecan sweet crisps, drizzled with a house-made pomegranate vinaigrette. They also include a small breadstick to go with the salad. It's available in cafe (which I got) and entree sizes for $5.99 and $6.99 respectively. Tias! are Kettle brand's all-natural line of tortilla chips promising nothing artificial and only natural color ingredients as well as gluten-free eating. Their Zesty Ranch Tias feature tortilla chips made with organic corn and flavored with buttermilk, green onion, and garlic. An 8-ounce bag carries a regular price of about $3.99 or about $2.00 to $3.00 on sale. Haagen-Daz recently ventured into the sundae cone business so to how they were doing, I tried new Snack Size Vanilla Chocolate Sundae Cones which is Haagen-Daz's version of the classic sundae cone in a smaller, portion-controlled snack size. A 11.2-fluid-ounce box of five individually-wrapped cones carries a suggested retail of $5.49, meaning: you're looking at a sales price of around $3.00 to $4.00. 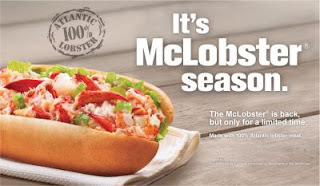 McDonald's new Premium Grilled Chicken Classic Sandwich replaces their previous grilled chicken sandwich with a new bakery-style bun and a new, lower-sodium chicken breast filet; the rest is much the same with leafy green lettuce, a slice of tomato and mayo. The price is at the lower end of comparable sandwiches at $3.79. The chicken version of Burger King's BK Burger Minis, BK Chicken Minis are very basic mini chicken burgers with mini, breaded, white meat chicken patties, a bit of mayo, and a slice of dill pickle on a mini-burger bun. I picked up four Minis at my local Burger King for $2.99. Subway's Buffalo Chicken Sub is their August Featured $5 Footlong and features a base of chicken strips, spicy buffalo sauce and ranch sauce with your choice of bread, cheese, and veggies. 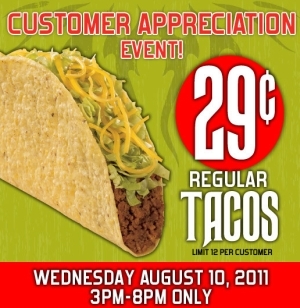 Del Taco is serving up 29 Cent Regular Tacos tomorrow, Wednesday, August 10, 2011 from the hours of 3pm to 8pm at most Del Taco restaurant locations. For those of you looking to stock up on these ridiculously cheap tacos, hold your horses, as there's a limit of 12 tacos per customer. The tacos are normally about 59 cents each. Additionally, there is a handy list of about 40 or so non-participating locations on Del Taco's Facebook page for you to peruse in case you don't want to just call your local Del Taco and check. BK Burger Minis are Burger King's slightly different return to mini "slider" burgers. They come simple with a mini flame-broiled patty, a slice of crinkle cut pickle, and a splash of ketchup on a mini burger bun. I picked up a pack of 4 BK Minis for $2.99 at my local Burger King. Apparently, it's McDonald's Hamburger University's 50th Anniversary this year. 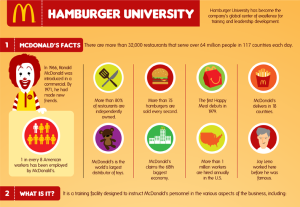 To celebrate, Online Colleges has come up with an infographic giving a visual representation of the scope of Hamburger University with a look at its structure and various factoids. You can check it out the full infographic after the jump. Avoid the Noid! Starting today and running for a week, Domino's is celebrating the 25th birthday of their former mascot, the Noid, by offering their Facebook Fans with a chance to win one of 10,080 (with one given out every minute of the contest period) $10 Domino's gift cards. 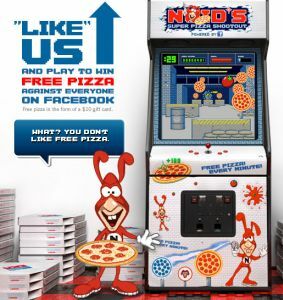 To win, you have to "like" Domino's on Facebook, play The NOID's Super Pizza Shootout game and post the highest round score during one of the many one-minute periods. The game features throwback 8-bit graphics that were the norm when the Noid made his television appearances for Domino's. For those hoping for a more substantial return of the Noid, don't hold your breath; he's just back for this one promotion which runs until Monday, August 15, 2011. Second-place coffee chain, Caribou Coffee now dishes out new Grown-up Grilled Cheese sandwiches in expanding their meal options. The sandwiches are available in four varieties: Three Cheese Classic, Gouda Turkey Pesto, Aged Cheddar Roast and Italian Chicken Melt and are available nationwide at most Caribou locations. 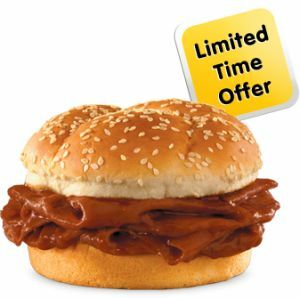 The Arby-Q sandwich, Arby's barbecue sauced version of their roast beef sandwich, is back for a limited time. You're going to want to call ahead to check availability as the sandwich is designated as "limited availability at participating locations" which means your chances of finding one could be hit or miss. The Arby-Q consists of Arby's trademark roast beef smothered in a tangy, sweet barbecue sauce and served on a toasted sesame seed bun. The last time I saw it, it was around 99 cents so you can expect a price around that mark. A 10.5-ounce bag retails for $3.79 or around $2.00 to $3.00 on sale. Looks like Pizza Hut is trying to drum up Facebook "Likes" and Email subscribers because for this week only, they are offering a free P'Zone (their version of a calzone) with any online pizza purchase to customers who either sign up for their email list (or are already signed up) or "Like" them on Facebook. The promotion is good through Sunday August 21, 2011 and you can only use it once. 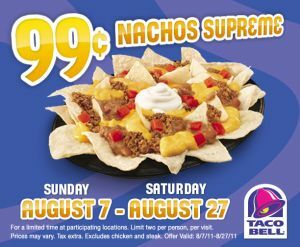 In with the new deal, out with the old deal: starting today and running until Saturday, August 27, Taco Bell is offering their Nachos Supreme for 99 cents. India with its large population and varied dietary preferences usually sports more localized fast food menu items than most other countries. Subway India is no exception and, in additional to the typical Subway bread and veggies, has quite a few localized meat and vegetarian options to go with said bread and veggies. 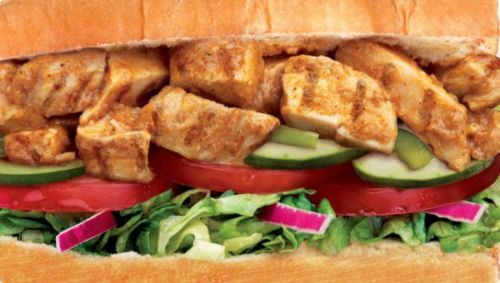 Options like the Chicken Tikka sub which features grilled boneless chicken breast pieces marinated in tikka seasonings. This week's International Weekend again goes with Poland for Bergen brand Apple-Raisin Cookies picked up for an easy $1.00 for a 140g (4.94-ounce) box. One of Taco Bell's staple menu items, the Burrito Supreme has been available for the last two weeks or so at a promotional price of 99 cents (with today being that last day to take advantage of the offer. It's normally priced at $2.69 at my local Taco Bell and consists of seasoned ground beef, refried beans, red sauce, shredded lettuce, cheddar cheese, diced onions, diced tomatoes and reduced-fat sour cream wrapped up in a flour tortilla. Banquet's Chicken Pot Pie is a budget pot pie option that provides 7 ounces of the standard chunks of chicken, chicken gravy, peas, potatoes, and carrots for usually under a buck. 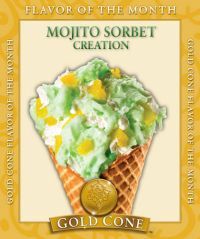 Cold Stone Creamery's Gold Cone Collection is their name for their limited-time Flavors of the Month. For August, the Gold Cone Collection is represented by Mojito Sorbet which couples the refreshing taste of mint with the texture and tart of a sorbet. Mojito Sorbet is available all of August served up with your choice of mix-ins. 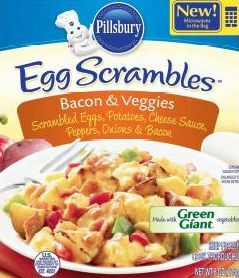 For people who are really pressed for time or really adverse to cooking anything (but still don't want to go pick something up), the Pillbury Doughboy has you covered with new microwavable Egg Scrambles and Grands Biscuit Sandwiches. Egg Scrambles combines fluffy egg, melty cheese sauce, Green Giants veggies, and bacon or sausage with the promise of " in just 6 minutes or less, weekend breakfast on a weekday." They're available in four varieties which clock in at 300 calories or less: Sausage and Veggies, Bacon and Veggies, and Sausage. Popeyes' new, limited-time Rip'n Chick'n is partially sliced into strips before being marinated with a blend of cayenne, habañero, white and black peppers, and then is hand battered, breaded, and cooked up in Popeyes signature crispy batter. It comes with Cajun Fries and a buttermilk biscuit for $3.99. On tap for August, Dairy Queen goes with the Nutter Butter Blizzard for their Blizzard of the Month. The Nutter butter Blizzard features Nutter Butter cookie pieces and Nutter Butter peanut butter creme filling blended with Dairy Queen's standard vanilla soft serve. As is often the case, the Cake of the Month follows suit and also showcases Nutter Butter. Papa John's new Double Layered Pepperoni Pizza offers two layers of different pepperoni: their regular pepperoni on bottom and another layer of premium deli-style pepperoni (wider, more flavorful pepperoni from what I can tell). It's available for a limited-time at $10 for a 14-inch large pizza. I've highlighted some of the stuff McDonald's serves abroad that we can't get here in the States but there's also a bunch of stuff here in the U.S. that are available at only select McDonald's, some only seasonally. It's not an exhaustive list (let me know if there's something I should add) but it's pretty interesting. Feel free to chime in with your own thoughts especially if you've tried some of these or know where they can be had. Los Angeles area Burger King restaurants are offering a great deal to get your Whopper on for 88 cents a pop on Monday, 8/8/2011 from 8am to 8pm. There might be buying limits and the deal is only valid at participating locations so you might want to check ahead. An 88 cent Whopper is pretty cheap with the regular price around the mid-$3 mark these days. 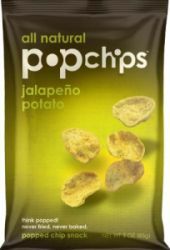 The un-fried, un-baked potato chip, Popchips, is now available in a new Jalapeno flavor. The new chips contain the flavor of spicy green jalapeno peppers to deliver a taste that is purported to be spicy, but not too spicy. Popchips are popped using heat and pressure which I imagine to be like the process of cooking kettle chips but with less oil. However, they do cost a bit more than a comparable amount of regular chips for the trouble. Panda Express's Garlic Lover's Chicken Breast is a new entree on their menu featuring slices of chicken breast wok-tossed with broccoli, baby corn, red bell peppers, a savory black bean sauce and a lot of garlic. I picked up a 2-entree plate including the chicken breast for $5.99.